If you were to ask my family what food I don't like, the universal answer would be "mushrooms." It is true, I have been an active member of the anti-mushroom camp for, well, ever. But, because I am a rather strange individual, I see that distaste as a personal challenge and I have set out to try and change my own mind. This mushroom mission is motivated by a (not-so-attractive) haughtiness about my own open-mindedness toward food. I figure that if I am going to talk a big game about my lack of food phobias, I better be able to back it up with some fungus consumption. As it turns out, I am happy that my pride prodded me in this direction, because I have found some things that I really like. My mushroom muse has been, no surprise here, my favorite food weblog, Smitten Kitchen. I have made pierogies (good, but I really would prefer potato or cabbage), a fantastic blue cheese-laced tart, a creamed-mushroom appetizer that I would be happy to have on any buffet table, and even a (gasp) mushroom soup. I am still not a fan of raw mushrooms or canned cream of mushroom soup (seriously, it is foul), but I won't automatically turn my back on a dish simply because it contains some form of 'shroom. A year ago, that is exactly what I would have done with this Rachael Ray "risotto" dish. I was watching Food Network one day, and when 30 Minute Meals came on and Rachael mentioned wild mushrooms, my first instinct was to change the channel. 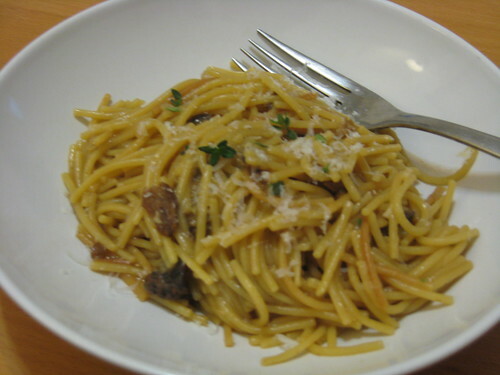 But I stuck around, and as I watched her toast pieces of broken spaghetti and then continue cooking it risotto-style with a mushroom-infused broth, I found myself adding dried porcini and spaghetti to my shopping list. *Just don't try to make me eat those rubbery canned mushrooms. Bleccchhh. Combine mushrooms, broth, and water in a medium saucepan and bring to a simmer. Turn heat to low and keep warm. Heat oil in a large saute pan over medium heat. Add onion and a pinch of salt and cook until translucent, about 5 minutes. Stir in the garlic and a sprig of thyme and cook another minute. 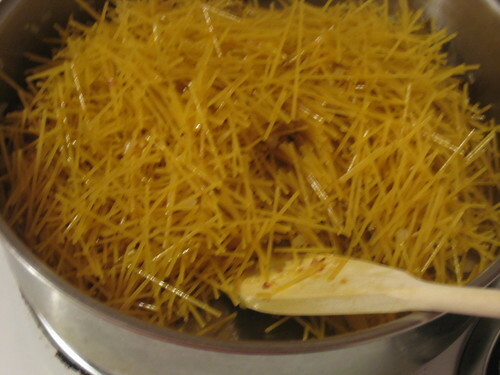 Add spaghetti and toast, stirring frequently, until golden, 6 to 7 minutes. Pour in the wine, and stir until it is absorbed. Begin adding the warm mushroom stock in 1/2 to 1 cup intervals, stirring until the liquid is almost completely gone before ladling in the next addition. When there is a cup or two of broth left, remove the rehydrated mushrooms, being careful to leave behind any grit. Chop the mushrooms and stir into the pasta. 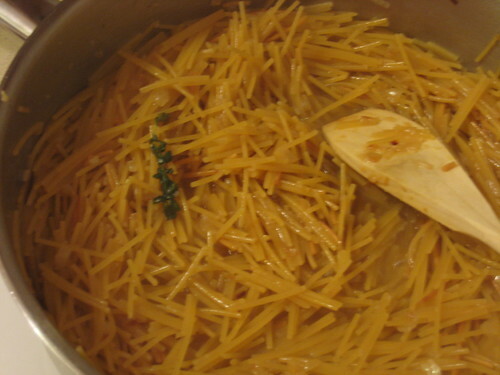 Continue adding liquid and cooking until the spaghetti is al dente, about 10 to 15 minutes. Remove from heat and stir in the butter and parmesan cheese. Season to taste with salt and pepper, garnish with additional thyme leaves and parmesan, and serve.